Antoine Dominique ("Fats") Domino, Jr.
Reading of Fats Domino's October 28 passing, I was struck by unlikely parallels between the pioneer of 1950s rock and roll and, of all people, the great classical composer Johannes Brahms. I remember once reading an account of someone coming to see Brahms and finding him out behind his house grilling sausages in the yard. Brahms also famously enjoyed dining with friends on simple peasant fare at a local inn. Fats Domino, as befits a musician who had a hot selling hit called "Jambalaya," was also a celebrated trencherman, and in fact he would take pots and pans with him on tour to do his own cooking in his favorite New Orleans style. Both, then, loved to eat well in the manner of the "common folk" long after achieving celebrity. In addition, both men were born in modest circumstances in port towns, both came from musical families not long resident there, and both would build on early training by relatives to become highly accomplished pianists. Both transcended relatively humble origins to become "household names." 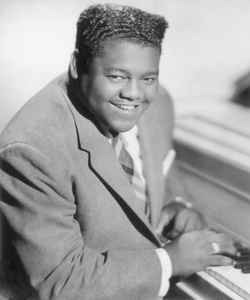 Most importantly, both would take older forms of music and carry them into the future, Brahms by recasting the classical symphony, the string quartet, the sonata, the theme and variations set, and so on in Romantic terms, becoming the standard-bearer for the "conservative" side of musical Romanticism; Fats Domino by taking the stride piano and rhythm and blues of his New Orleans heritage and morphing them into the beginnings of rock and roll. Antoine Dominique Domino, Jr., was the eighth child of a family recently arrived in the New Orleans area known as the Ninth Ward, and he made his home there the rest of his life until displaced to a nearby suburb by Hurricane Katrina. He never finished fourth grade, leaving to take a job with an ice delivery company. His first public performance was at age 10, and by age 14 he was playing piano in New Orleans bars, having learned the instrument's basics from his brother-in-law, a jazz guitarist, thereafter being largely self-taught by listening to and emulating records, including disks by the likes of Meade Lux Lewis and Pinetop Smith. Bandleader Billy Diamond--who conferred on Domino the nickname "Fats," both because his playing was reminiscent of Fats Waller's and because of Domino's copious appetite--hired him to play in his band at the Hideaway Club. Not long thereafter, Lew Chudd, the owner of Imperial Records, signed Domino to a contract that, unusually, provided royalties per record sold rather than a flat fee per recording. And sell Domino's records did, more than 65 million copies over the course of his career. Five of his records had achieved gold status, with more than one million sold, by 1955, with 20 or so to follow, and 35 would make the Billboard Top 40. In the 1950s and early 1960s, only Elvis Presley had higher sales. The first of Domino's million sellers was "The Fat Man," generally credited with being among the first rock and roll songs, which he recorded shortly after signing the contract with Imperial; no other rock song had achieved such success by that point. Other big hits included "Blueberry Hill," "Ain't It a Shame," "Blue Monday," and on and on. Domino also appeared in 1950s films, and he toured widely, not always without incident, as he was helping to break the color barriers of his day. Even after changing public tastes led to a decline in his sales starting in the middle 1960s, he continued recording and performing, although eventually he chose to restrict himself to venues in and around New Orleans. Domino and his wife, Rosemary, were married from 1947 until her death in 2008. They had eight children. In later years, Domino ceased touring but still played in New Orleans, and, to return to his culinary leanings, was known for cooking up large feasts for family and friends. Domino received a number of honors and awards; among them, in 1986 he was among the first members inducted into the Rock and Roll Hall of fame, and he received a Grammy Award for lifetime achievement in 1987. US President Bill Clinton awarded Domino the National Medal of Arts; subsequent US President George W. Bush personally presented him with a replacement when the original was lost in the flooding of Domino's home during Hurricane Katrina.